This generous arrangement elegantly completes any celebration or get-together. 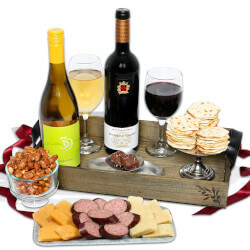 Inside a handcrafted wooden crate, your recipient will discover a dense, complex Menica Roble and a crisp, golden-hued Chardonnay, which are surrounded by an assortment of classic gourmet treats. Boasting crisp butter toffee peanuts, premium gourmet cheese, and a handcrafted garlic sausage, this harmonious arrangement is the perfect complement to any occasion. Oh snap! No Similar Gift Ideas Found.